As a child, growing up in the Côte d’Ivoire, I found myself at the Félix Houphouët-Boigny International Airport quite regularly. Often, it would be to send off or welcome my Dad to or from one of his many work trips, but at other times, it would be because I, some other member of my family, and/or one of our many visiting friends and relatives were headed to or from yet another destination by air. Whatever the case, it was during these frequent visits to this airport that I first became aware of the item that I would like to tell you about today. In the eighties and nineties at the airport in Port-Bouët, it was common place to see travelers laying around on the floor, in the nooks and crannies of the airport, surrounded by other travelers and loads of luggage. It was obvious that these travelers had been or would be at the airport for more than just a couple of hours, and their luggage was unlike anything I was accustomed to associating with air travel. Instead of the usual suitcases, these travelers carried huge woven bags, made of plastic, that were usually blue (or black), red, and white in color – the bags were striped. I was not sure what these travelers carried in these bags, but because they were similar to the bags that I often saw in markets used by vendors to store their merchandise, I assumed these travelers were merchants and that these bags contained their wares. This is the type of bag I am talking about. Does anyone know what they are called? Fast forward to 2007. 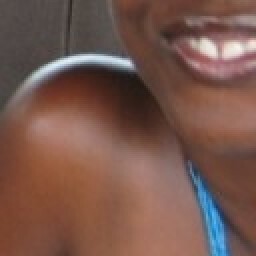 At this time, a good friend of mine was moving back to Nairobi after spending some years in Kampala. She was making this transition on her own (as opposed to being sponsored by an organization) and was doing it on rather short notice. In a week’s time, my friend had wrapped up her life in Uganda, sold the majority of her household goods, and appeared at my doorstep with two suitcases and a number of these plastic woven bags in tow. This was the first time in a long time that I was seeing these bags again, and quite frankly, I thought this was an ingenious way for my friend to have packed her belongings during her move. This is why, a couple of months later, as I embarked on a transition of my own, I called up my friend to inquire where she had purchased these bags. 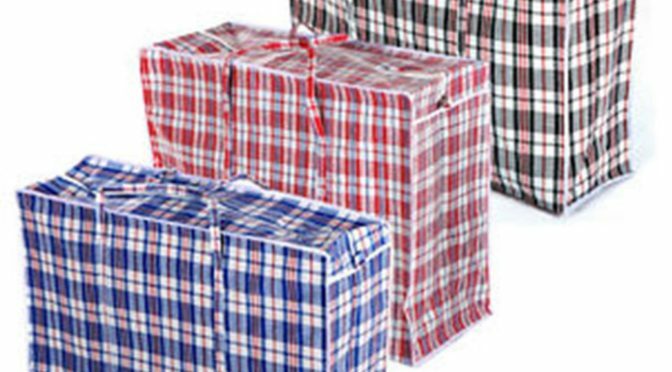 Unfortunately, she told me she had bought the bags in Kampala and was not sure where I could find similar bags in Nairobi. Not to be discouraged, I set out on a mission to find bags like these in a city that I felt I knew fairly well. The bags came in several colors (which was great for organization) and in all sizes, from very small to extremely large. From experience, I have since learned that although the larger bags pack greater volumes, these volumes can add up to a weight that causes the bags to tear when being carried. Unless you are dealing with stuff that is very light, I recommend the use of the medium-sized bags which still allow for the packing of substantial volume, while helping to limit the bag’s total weight. After selling my furniture and most of my household goods, I packed the rest of my life into a suitcase and six of these medium-sized bags. The bags, just like those my friend had used during her move, served me well during my transition and continue to do so to-date. Although a few of them gave way, under the weight of heavy things such as my great collection of books :-), I use the rest of them, today, to store or transport bulky items such as duvets, pillows, or my mother’s collection of West African mudcloth. 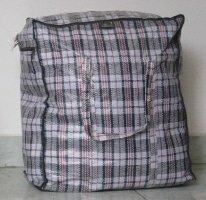 I was very pleased when I discovered the handiness of these woven plastic bags, both for storage and for moving things. If you are in the need of an efficient, neat, and inexpensive way to store or move items, these bags might be just what you are looking for. I’ve shared with you where I managed to get them in Nairobi and at what price, but I am pretty sure you can find them elsewhere in East Africa – all you need to do is look. With that said, it’s time for me to sign off. I hope this information serves you in some way. If it does, please let me know all about it. Here in London the bags are £1. You are right most market traders use them to carry their stock,lol. I have noticed that a lot of people here, use them to carry clothes to the laundrette. You are right, they tear pretty easily. I have seen people using them to check in with at Heathrow, and wonder whether those bags ever make it to their destination. Reading your comment has me cracked up in amazement. Before I wrote this post, I was talking to my youngest brother asking him whether he might know what these bags were called. He told me that he was clueless about that but suggested that they might somehow be related to British Airways because apparently when another of our brothers’ bag fell apart at Heathrow airport, the BA staff gave him one of these to pack his stuff in. I didn’t believe it was possible and just dismissed my baby brother’s story. Hehehe…Guess not! Where in London would these bags be purchased? At the supermarket? Believe it or not, they actually do get to their destination! My Mom traveled with one from Mali to Kenya a while back (oh how I laughed when I saw her do this!) and it held up intact even though it was packed to maximum capacity. You can buy these bags at most of the pound shops in London. Or you can buy them at markets at stalls that sell luggage. All the local pound shops near me sell them. I use them to throw my laundry in, but they don’t last long. I am really impressed that your mom’s luggage arrived intact. The way porters throw luggage around at airports, these bags are not durable. They are so easy to rip open for thieves too, so again I am baffled. I didn’t think you could lock them to check them in. I don’t know what they are called either but since they are made from the same material used to make those bags we pack the big sugars in, in our house we just say big plastic bags…..and sounds even worse in kiswahili coz it we commonly use the term “bag ya gunia”! I have seen some really pretty ones with cartoons drawn on them on the street. I have never owned one but since I am going to be moving soon I guess I better go out and purchase some. Thanks for the great article as always. I am glad this post was useful to at least one other person. It makes my writing it well worth it! Lol. 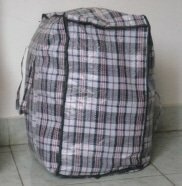 You also refer to it as “bag ya gunia“? Me too, I normally just call it a gunia bag, but then realized as I was writing the post that it’s actually not made out of gunia (sack cloth) but rather plastic and so I settled on the title that I did. I think I’ve also seen the ones with cartoons on them but only in Asia. Talk about beautifying such a kawaida item. I will be getting a dark coffee brown briefcase from Saddleback…it should be here in ten days. I am excited. How exciting for you! Please let me know what you think of your briefcase once it arrives. On a different note, as I was browsing through the questions section of the website, I came to the question: Which color should I get? Apparently, people’s choice of color can be related to personality. Just to test their system, do you think your personality matches what they’ve written under the color dark coffee brown? If you find this question too personal, please feel free not to answer. I am just curious to know if their system is reliable. Hmm, very interesting. Maybe I should have read that question before I bought mine. 🙂 Actually, I would say it is close, except for the musical part (maybe for lack of opportunity). But the one that fits me more closely is the Tobacco Light Brown synopsis, which is a similar description in wording, though it gives the opposite personality of Sanguine. Oh well, maybe I will redefine what people think when it comes leather. Hahaha! I will let you know what I think of it when it arrives. Thanks for going along with my question. So can we safely say that their system doesn’t work entirely? 🙂 Lol. I look forward to hearing about the briefcase when it arrives. I’ve got a dark coffee briefcase (large size holds my 17″ laptop perfectly) from Saddleback – it’s been great for day-to-day work use and travels well. It can be a little large for more casual things, so i’m looking at getting either a messenger bag or laptop bag at some point down the road, too, but as a work briefcase, laptop bag or carry-on it’s fantastic. I’ve had it about two months, and my home office still smells entirely of leather after it’s been sitting there for five minutes. The thing’s clearly going to be around forever, and well worth the price. Thanks for sharing about your Saddleback briefcase. Your description of its smell makes me look forward to experiencing one of these for myself. this is probably a bit late for your needs – they are called LAUNDERETTE bags. I found this page while googling for these very same bags – as i just decided that they will be perfect for me moving! It’s never too late to learn something new. But…are you sure that’s what these bags are called? Doesn’t that name just stem from the fact that they are often used as laundry bags? How did the bags serve you during your move?